When you look at the photo above, what do you see? 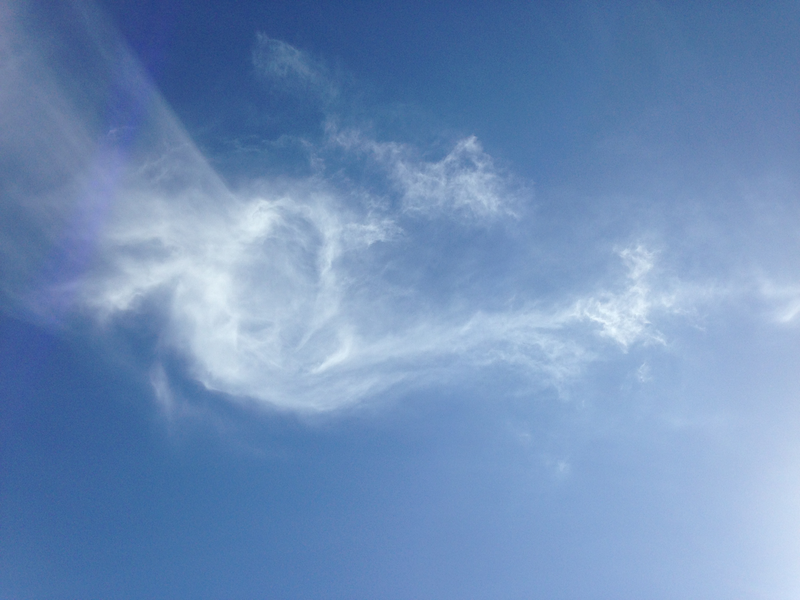 I see a cloud angel. I snapped this with my trusty iPhone camera awhile back. Then I came across the quote above from my friend over at Chalkboard Quotes click here to visit and thought it was a perfect match for a Saturday! Do you ever think of what will happen when you die? Who will remember you? In what capacity will you be remembered and by how many people? Will you be the memory that brings a smile, a tear, a blessing? Or will you be the memory which dies after time? I want to make a difference in lives that I touch, in the people that I connect with in my life. I don’t need a big legacy to leave. Just a smile, a happy memory of something I’ve said or done to help, a small token of kindness that perhaps didn’t change your life, but simply changed the moment for the better. I’m simple that way. I just want to help you find happiness. To be your biggest fan and to support your amazing self. I just want you to find inner peace and revel in it! An Easy Way to Increase Your Happiness! My dear friend RoSy blogged this awhile back ~ check out her blog! It made such a difference in my day that I knew I had to repost it for you! I adore what I do which is connecting with others via my blog, my cards and my FB page (besides just meeting people in real life!). I am a big proponent of telling people how I feel and for feeling that gratitude in sharing how blessed I feel to have so many wonderful people in my life! I hope it made you smile and perhaps even changed your way of thinking! If you are looking for more happiness in your life, this is the answer…baby steps to a happier you ~ and in turn, making someone else happy as well! 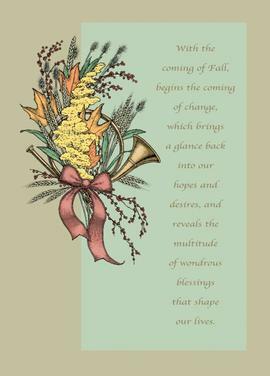 Happy Thanksgiving to those of you who are celebrating today ~ and to those who are not, I wish you gratitude, love, peace and health. This is the psalm that my Mom repeated to us nightly until we were able to repeat it properly and I’ve never forgotten it! As I like to say, it’s a keeper ~ just like you! and reveals the multitude of wondrous blessings that shape our lives. Thanksgiving is on the horizon, Christmas and Hanukkah too as you can see in the stores with their brightly lit decorations lately. 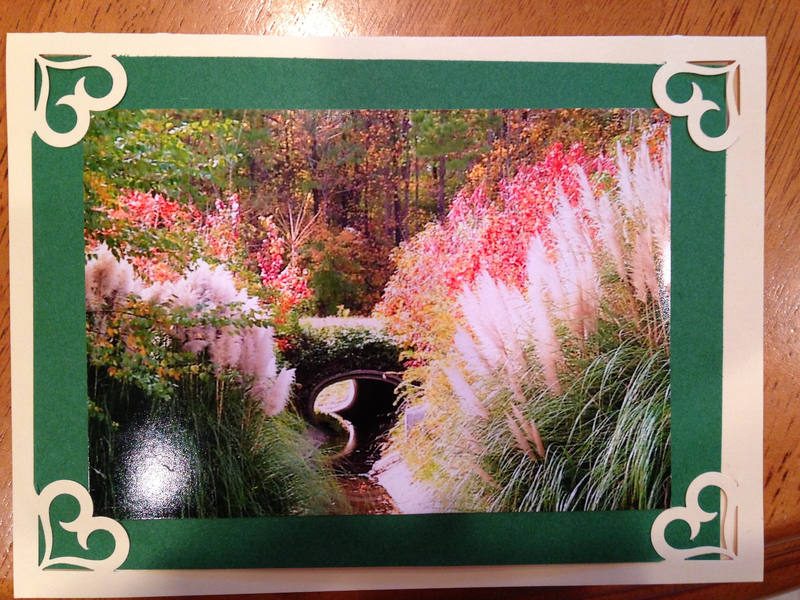 I realize that Fall has already started, but I like the quote and the card so I used it today. Because I think now’s the time for us to realize this change in our lives and begin to count our blessings that are shaping our lives. Sometimes, it’s hard to find blessings and to count them, especially after a loss. Minds can get stuck in that raceway of grief and we are unable to stop the car and get out to stretch our minds. It’s like being on that hamster wheel and feeling afraid to jump off, so we continue to run the same sad tapes in our minds. It takes courage, it takes a hand to hold and it takes strength to put mind over matter. And it’s not easy. Finding and accepting the new normal which comes after the death of a loved one can be difficult as anyone who has had a loved one already know. To count our blessings and get into a gratitude state afterwards is often a steep hill for some people because they are mired in the loss. I’ve watched as my own Mom stagnated in her sadness since the loss of my Dad 1.5 years ago. Weekends are the hardest for her as that was when he was home all day and she misses that part of her life. 1. Start small. Be thankful you are here. 2. Look up ~ spiritually and literally! 4. 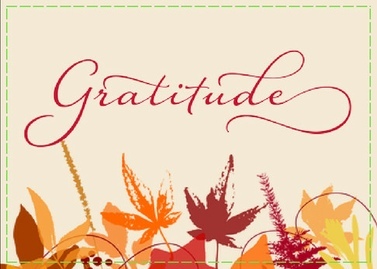 Start a gratitude journal ~ write down one or more items every day for which you are grateful ~ more if you can do it! 5. Write down the people in your life ~ list why you are grateful for them. Everyone is here to help you in one way or another. Sometimes we have to start small in our gratitude. There’s no need to be grandiose about this ~ begin with I woke up this morning for that’s something we are all grateful for ~ we are happy you are here! Then you can expand a bit, being thankful for the ability to read, to speak, to see ~ even to breathe clean air! You can be thankful for your shelter, the heat or fans if you are in warmer weather ~ air conditioning! Gratitude for food, the ability to taste and smell! Perhaps you’re thankful for the electronics in your life so that you can see the world-wide connections available to you. Do you get what I mean? You can be thankful for the people in your life, past and present. Each one has given you their presence as a present even if sometimes it’s harder to realize what the present was ~ but there’s always a present in that silver lining. You just have to search a bit sometimes. Do you see what I mean? It just takes time, but you could list so much that you are appreciative of ~ I know I can! I’m grateful for our connections here on the blog o’sphere! Need Your Vote PLEASE before Thanksgiving (Thursday)! I’m asking for your help today and knowing how wonderful our community is, I am hoping that you will do me this small favor because it’s a good thing to do, it takes 3 minutes tops and because it helps others. 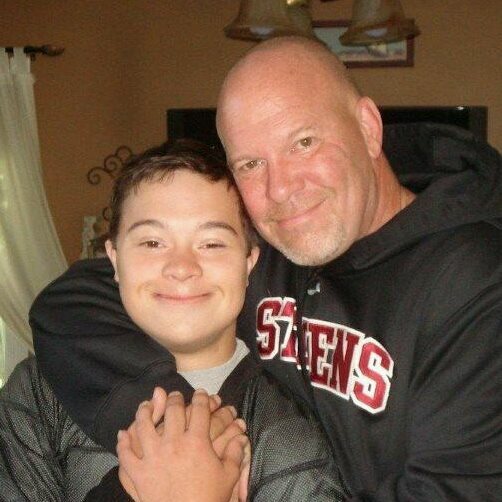 A friend sent me a heartwarming email with Dan Richards’ story about how he is a local hero who makes a difference in his own son’s life as well as many others who are disabled. His story touched my heart and I forwarded the email to whomever I thought would vote. The funny thing is that 2 friends have already contacted me this morning to tell me that they know him personally (I don’t know him nor did I know of him and his great personality), and they took the time to tell me how happy they were that I had forwarded the email about their friend. Small world, isn’t it? Dan is an inspiring football coach in Point Pleasant, NJ who has been instrumental in starting a “Challenger Football Team”. Challenger Sports are run by volunteers who provide sport experiences for children with disabilities. Baseball, soccer, track, surfing, basketball, they all have Challenger Teams. What a heartwarming story to hear how people are MAKING A DIFFERENCE in the lives of children with special needs! There is a team now of 13 players who practice on Thursdays and play on Sundays. The local high school team players are the Challenger players’ buddies ~ they teach them the game, they practice with them and they play with them. What a win-win situation for all involved! So why am I telling you all this? Coach Dan has submitted a video to the NFL’s contest “My Football Story” ~ the winners get a trip to the Super Bowl complete with a “Meet and Greet” session and other goodies. Please click on the link below, watch the 3 minute video and then “LIKE’ it so that he can win! Click here to vote for Coach Dan Richards! Please feel free to share! Thank you! P.S. Here’s another little video of the team! Let me tell you a story…I went to my mailbox the other day and this was what I found inside, nestled in with the junk mail and the bills. What a lovely surprise, don’t you think? Excuse the photos, I was using my iPhone and I’m not very good with it as you can tell ~ but my heart’s in the right place, so please keep reading…. 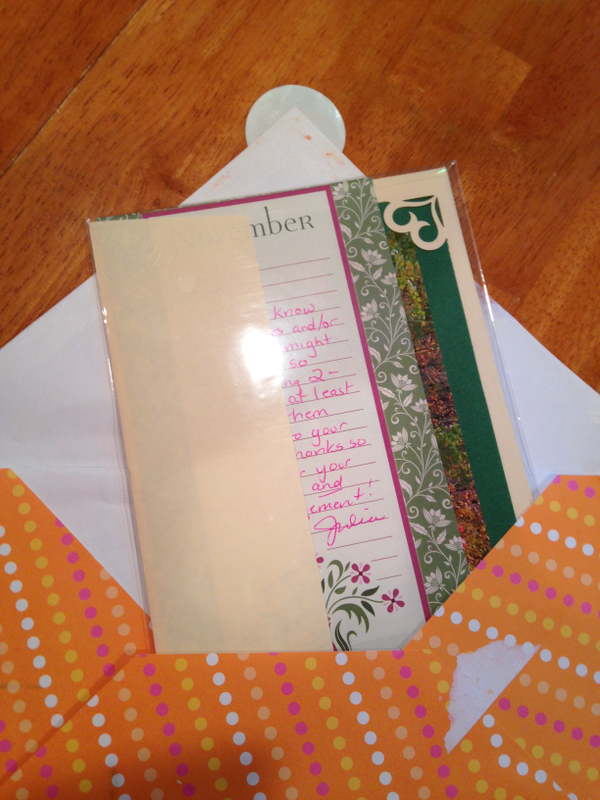 So I opened the envelope…and saw a note from my dear blogging pal Julia Denton over at Defeat Despair! I was so excited to get this which is my early Christmas present from her! You see, she just celebrated her First Year Blogaversary and she threw a special party for her readers and sent US gifts! 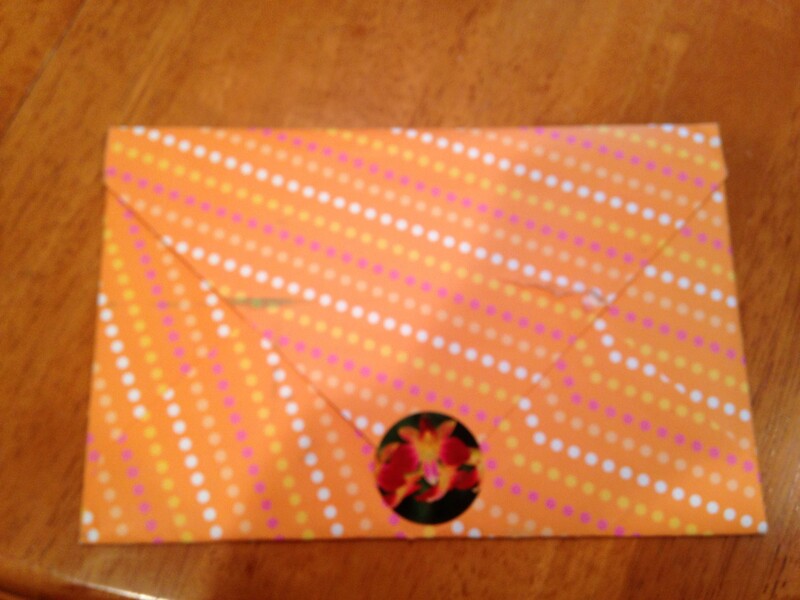 So it actually wasn’t a surprise as I knew she would be sending something special. 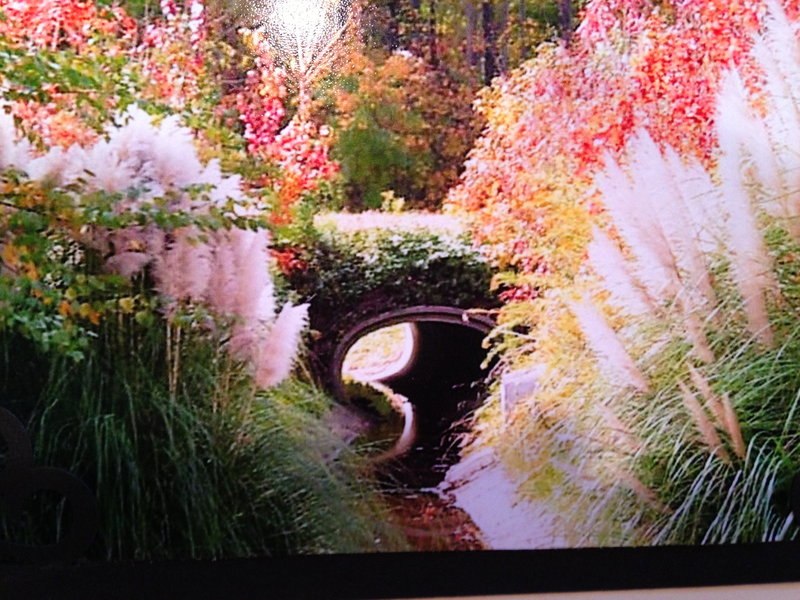 She offered to send a card that we could send using one of her photos (she has amazing photos on her blog) ~ so I picked the photo below and sent in my request. Lo and behold (sorry, I’ve always wanted to use that phrase), this is what she made for me! 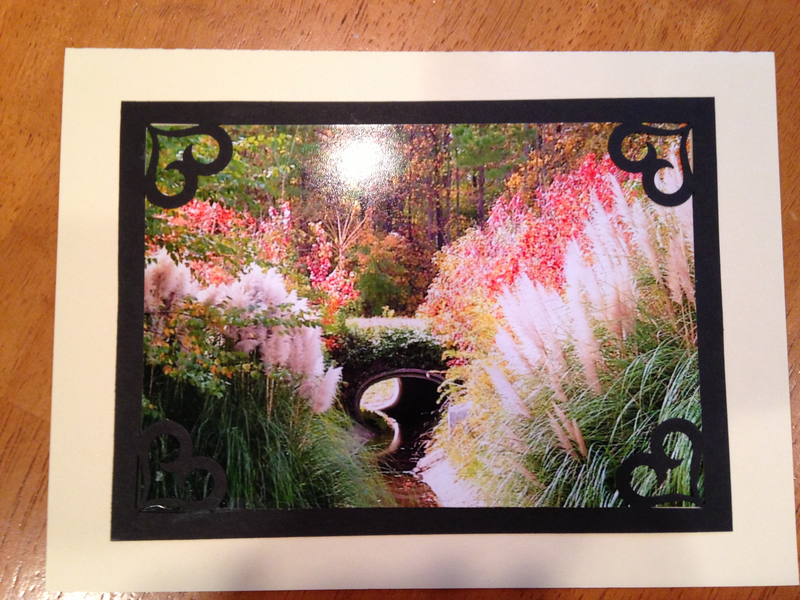 The amazing photo with a black heart border and white card…complete with matching envelope! And then also, the same but in green! As she wrote in her note, she didn’t know which one I would prefer so she sent both! How Sweet!!! we are all connected in special ways ~ I treasure our connections! Thank you Julia for being such a special connection in my heart! Please make sure that you stop by to visit Julia and DEFEAT DESPAIR! and tell her Misifusa’s Blog ~ The Presents of Presence sent you!